Whitney Jones won her first Fitness International, Candice Lewis-Carter celebrated her second Figure International victory, Angelica Teixeira took home her second Bikini International win and Shanique Grant won her first Women’s Physique International. 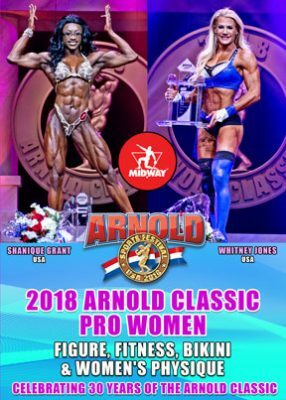 “A massive year of firsts to celebrate the 30 Years of the Arnold Classic.” Highlights of the IFBB Pro League events this year included the following: Whitney Jones won her first Fitness International and Candice Lewis-Carter celebrated her second straight Figure International victory. Angelica Teixeira took home her second straight Bikini International win and Shanique Grant won her first Women’s Physique International title. 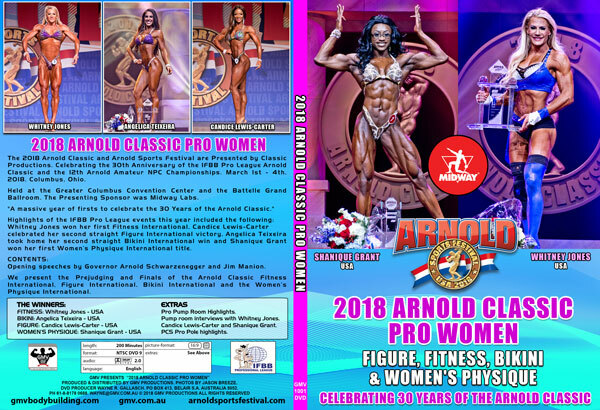 We present the Prejudging and Finals of the Arnold Classic Fitness International, Figure International, Bikini International and the Women’s Physique International. The top 10 in the Women’s Physique all pose at the Finals. Pump room interviews with Whitney Jones, and Candice Lewis-Carter.